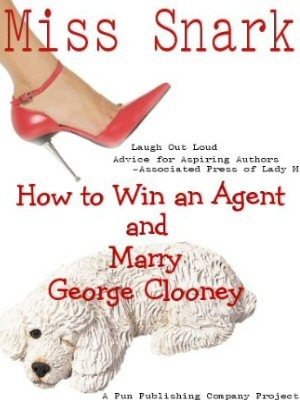 Miss Snark, the literary agent: Nitwit! I've said this before, I was coauthor on over thirty journal articles in engineering and none of us ever back-talked or snarked an editor. I can't begin to describe the awful things reviewers made us do to the manuscript to get the results published. Granted this was not fiction but the lesson is the same. Don't say anything that you'll regret to an agent or an editor. And as for knowing the status of e-mails. Don't effing believe it. I know how that works and I know how wrong it can be. It's an ugly, ugly, ugly story I thankfully wasn't involved in when it happened. I thought the OP was just explaining that you should never rely on read receipts. My own email package (yMail) completely ignores requests for read receipts, and also ignores all other methods of email tracking, which means I can read my mail without alerting the sender to the fact. I reply when it suits me, not them. It is weird, isn't it, how many hopefuls approach you more like you're an enemy who's got one chance to surrender before you get the full blast of their righteous hatred than like you're someone they want a working relationship with. Do they actually want to be published, do you think, or are they happier feeling angry? For a techno-idiot who uses Outlook Express, can people really tell when I've read their e-mails, other than when they request receipt? What about yahoo? And here I am thinking I'm reading in private, yet somebody is checking up on whether I've read their e-mail. Read receipts are evil. They say, "I don't trust you". Avoid. for all intents and purposes, Most likely, they cannot tell whether you've read an e-mail or not. They can only tell if you've downloaded it from the server and I suspect that even then, they can't find that out routinely. And if they do, who cares? Why worry? If you don't want to read it for a week, it's your business. I existed in a mail system that revealed the details of sent mail and response. It caused no end of grief, ugly recriminations, and other stupidity. I was lead auditor and when I saw that someone didn't open their email (I had some real luddites involved), I just walked over and had a pleasant chat with them rather than scream and fight. Me, I would quickly lie that the e-mail ate the message and I never saw it and plead ignorance of bits and bytes of e-mail servers. BTW - I have a cousin who hasn't had a working computer for eight or nine years now. But his children receive all their school reports by e-mail and his wife runs a hockey league by e-mail. Do you understand that situation? It's not worth me understanding that situation, is it? It would only cause grief and heartaches. And that's my opinion of return receipts and open notifications.